The discipline of electronic engineering is fundamental to understanding, developing and applying many of the technologies that are so pervasive in today's world. 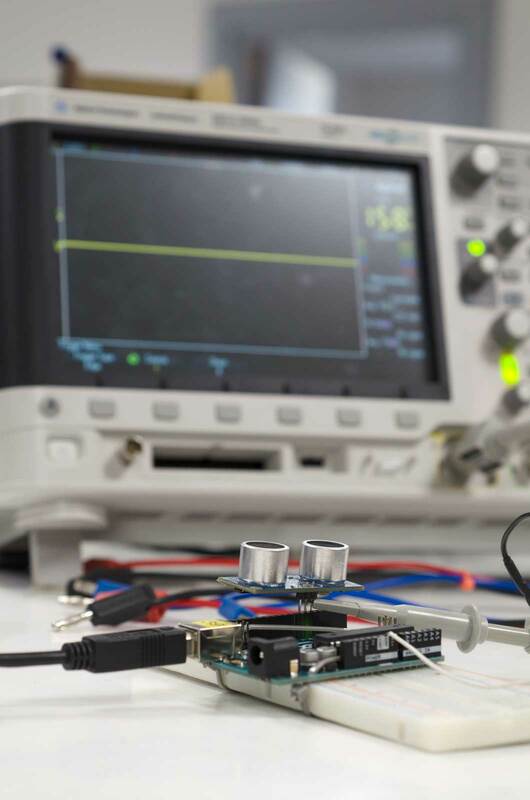 From materials and devices, through the design of electronic circuit hardware and software to application areas such as digital media, telecommunications and bioengineering, electronic engineering is a discipline rooted in electrical fundamentals but constantly pushing the boundaries of functionality, performance and application. Built on a core of engineering science, the practice of electronic engineering incorporates the important dimension of creative design as new systems are devised as solutions to real world needs and problems. One of three departments constituting the School of Engineering in Trinity College, Electronic and Electrical Engineering is centred in the modern Aras An Phiarsaigh building. The Department also occupies space in the unique historical StackB building in the heart of the financial district of Dublin, in the Sami Nasr Institute in the East End of College, in the purpose built Trinity Biomedical Sciences Institute. The overarching goal of the Department is one of delivering the highest standards in the education of electronic engineers, whether through taught programmes such as the BAI/MAI Integrated Engineering programme, the M Phil in Music and Media Technologies or by way of its postgraduate research activities. These programmes seek to prepare graduates who are intellectually rigorous, technically expert, and creatively alert to the possibilities and challenges raised by the socio-economic zeitgeist. Complementing and informing the taught programmes is a range of research activities that have become firmly established over time with support from national and EU funding agencies and from industry. This research is focussed under the broad headings of digital media, telecommunications, signal processing, circuits and materials. As in other disciplines, research in electronic engineering is significantly team-based and collaborative. This brings the Electronic and Electrical Engineering Department into working contact with other groups in College such as the SFI research centres Connect and ADAPT and the Trinity Centre for Bioengineering (TCBE). The Department also has many links with groups outside college. Further details are available on linked pages.